Often called the “Pearl of the Adriatic,” Dubrovnik is Croatia’s chief travel destination. Why? Because it is a total package of old world charm, history, arts and culture and stunning beaches. Check out the delights of Dubrovnik. Dating back to the 7th century, Dubrovnik’s old defensive walls are a sight to behold. More than that, you can walk along the top of the walls and see splendid views of the city’s orange rooftop houses sitting in striking contrast to the azure blue sea. Additionally, the three entrance gates of the walls feature attractive architecture. 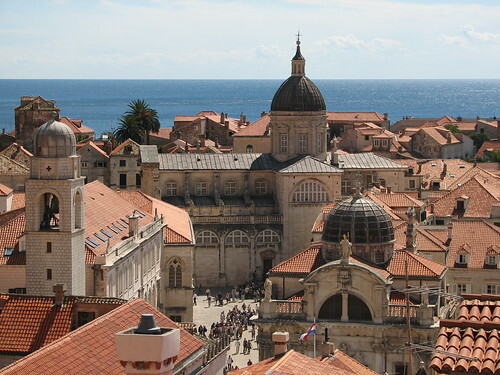 Dubrovnik’s Old Town is its most popular feature. Made up of cobblestone streets and old stone buildings designed in elaborate architectural styles and decorated with colorful flowers, the Old Town is a wonderful place to explore. At night, the Old Town is lit up with golden light, making it appear cozy and romantic. The Old Town is packed with many beautiful and historic buildings that are worth checking out. Some of the most popular structures include the 16th century Sponza Palace and Rector’s Palace, a Gothic-Renaissance beauty with ornate archways. A round, 16-sided water fountain, Onofrio’s Fountain, is considered a 15th century engineering marvel. Dubrovnik is teeming in stunning churches that are well worth a visit for their history, architecture, art works and relics such as the Church of St. Blaise, the Church of St. Ignatius, the Cathedral of the Assumption of the Virgin Mary, and the Franciscan Monastery. While strolling through the Old Town, you may also want to get a bite to eat in one of the many cafes or find a bargain souvenir among the variety of handcrafts being sold by local artisans. At the War Photo Limited museum, you can learn about Croatia’s recent War of Independence through powerful and moving photo exhibits. Located inside Rector’s Palace is an excellent museum displaying paintings, furnishing and other artifacts from Dubrovnik’s extensive history while the Etnographic Museum tells the spiritual, economic and social stories of Dubrovnik through folk costumes and antiques. Formerly an old hospital, Art Workshop Lazareti is the city’s cultural center where you can see theater productions, concerts, films, exhibitions and more. Every summer, Dubrovnik hosts one of Croatia’s largest festivals, the Dubrovnik Summer Festival, which involves open-air music concerts, theatrical plays and visual arts. Bordered by the Adriatic Sea, Dubrovnik offers several splendid beaches for swimming, sunbathing and socializing. The most popular is Banje Beach, which is nearby the Old Town. Situated along the city’s Lapad peninsula and nearby hotel accommodations, the Lapad beaches offer activities like water polo, volleyball and football. Tucked inside the bay of Dubrovnik is the picturesque island of Lokrum, which also features lovely beaches and activities like sailing, kayaking and yachting. If you can’t wait to experience the beauty of Dubrovnik, you can begin your travel plans today by letting HotelDealSite find you the absolute best hotel deals.